It was raining, not hard and not continuously but enough that after a day of plodding around planting tomatoes in the mud I didn’t feel like collecting flowers. More rain this morning but by the time I got home from work it had cleared enough to pick these slightly bedraggled iceberg roses. A standard rose almost 20 years old, growing in a hot spot between the driveway and the door, subject to runoff from the drive in winter and drought in summer, Iceberg blooms madly, never gets blackspot, ignores aphids and the occasional bucket of warm water to deter them, and smells sweetly. I imagine it as a streetwise rose, not romantic and fluffy but tough. With it I have Salad Burnet and foliage of Asparagus Fern, Jasmine, Pyrostegia, and Tecomanthe dendrophylla. Thanks to Cathy for hosting ‘In a Vase on Monday’ every week at Rambling in the Garden. 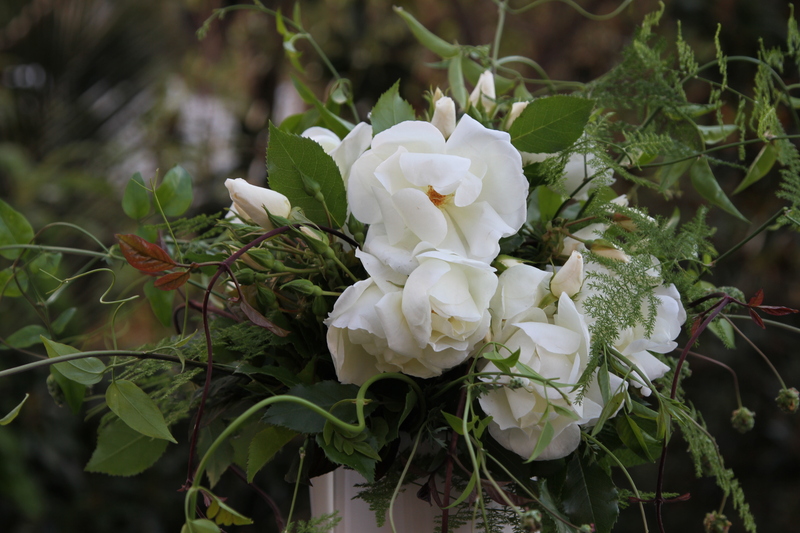 There is something so dramatic and stunning about white blooms and green foliage in a vase…and especially white roses…you have arranged them beautifully! 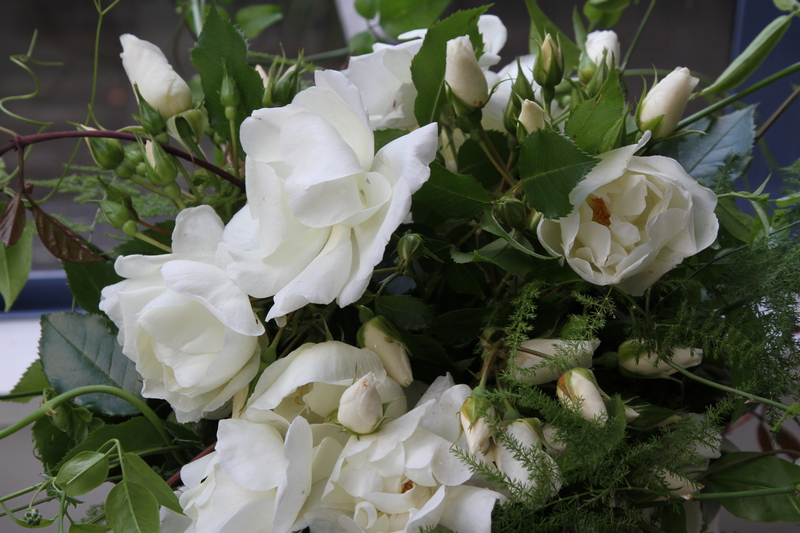 Thank you Donna, there is something really nice about white and green. It’s very fresh I think, or calming. I thought it would be nice to have these colours in a bedroom. You’re right ‘Iceberg’ is a tough rose but its flowers look beautiful. Sorry you’ve had a lot of rain but it will help the tomatoes establish! Yes, I’m grateful for the rain and it’s a big help for the toms. I’m just whinging. 🙂 Our soil is pretty clayey so it adds another 10 pounds to each boot, and it’s not so good for the soil walking on it. That’s a great recommendation for Iceberg and it looks stunning in this ‘wild’ vase – thanks for sharing it, and for some of your rain! I love your description of Iceberg roses as “street wise roses”! It’s perfect. I had this shrub in my former, largely shady garden and it bloomed even there and never had mildew or disease. I really should find a place for it in my “new” (5 year-old) garden. I’m so envious you have such an abundance of Iceberg flowers, I love their flat-topped form and bush looking like a big bouquet. I can remember when mine used to bloom like that but this year with the drought and placement on top of a bank, it only had a few. The abundant varied greens in your vase, especially the ferny ones, make it look so sophisticated, Cath. Thanks Hannah, I’m glad you like them. I completely lost some of my rugosas which were on a bank in the drought last summer. I’m sure it didn’t help that they were surrounded by weeds either. I grow that asparagus fern in a pot because I like it in vases. I was tempted to scoff at the warnings about it being a terrible weed until it climbed right up into a tree. It’s got nasty little thorns too. Anyway now I know it’s tricks I keep an eye on it. I figure it’s OK to have these potential weeds so long as they stay in the city. Thank you Eliza. I was almost not going to make the effort and I’m glad I did. I’ve been brushing past that rose most days for almost 20 years and never brought it inside. Wow, that’s amazing. 🙂 I’m trying to think if I could say the same about something in my yard. Could be!